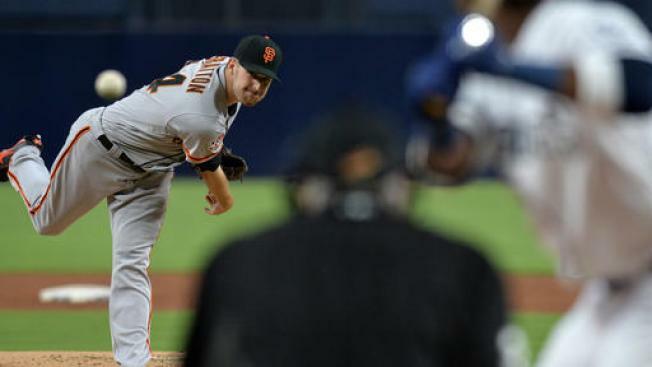 Chris Stratton and the Giants blanked the Padres on Thursday night. The Giants scored two runs in four games the last time they were on the road. On Thursday, they scored three in the first inning at Petco Park. That easily held up thanks to Chris Stratton. The right-hander continued to push his career to new heights, allowing just one hit in seven innings of a 7-0 win over the Padres. The lone Padre to reach via a hit was Clayton Richard, a starting pitcher who pinch-hit for the struggling Bryan Mitchell in the third and poked a single. Other than that, Stratton dominated, and the lineup had little trouble with a developing pitching staff. We have a first: Stratton went seven innings for the first time in his career. He had previously gone 6 2/3 innings on three different occasions. Since moving into the rotation last August, Stratton has a 2.47 ERA in 12 starts. On Thursday he became the first Giants starter this season to throw 100 pitches in a game. Early struggles continue: The first inning rally was almost a low point for Evan Longoria, who is off to a rough start. With the bases loaded and one out, he bounced a ball to short. It was hit too softly for a double play, though, and Longoria reached as a run scored. Hunter Pence’s broken-bat single two batters later brought a couple more runs home. The floodgates opened from there. Longoria later had two singles. The streak: Buster Posey extended his hitting streak to 10 games with a double in the sixth. Posey is batting .375 on the season. He remains good. Law of the Land: Derek Law was called up earlier in the day and he threw well in the eighth. Law had a 1-2-3 frame, striking out two. He pitched the ninth, too, and had another 1-2-3 inning.